2013- Assistant Professor, Department of Pharmaceutical Sciences, Eugene Applebaum College of Pharmacy and Health Sciences, Wayne State University. 2010-2013 Research Assistant Professor (Dr. Judy L. Bolton, Dr. Gregory R. J. Thatcher), Department of Medicinal Chemistry &Pharmacognosy, College of Pharmacy, University of Illinois at Chicago. 2005-2010 Postdoctoral Research Associate (Dr. Judy L. Bolton, Dr. Gregory R. J. Thatcher), Department of Medicinal Chemistry &Pharmacognosy, College of Pharmacy, University of Illinois at Chicago; Research: drug discovery and chemical toxicology. 2002-2004 Postdoctoral Fellow (Dr. John-Stephen Taylor), Department of Chemistry, Washington University in St. Louis; Research: nucleic acid chemistry. 2000-2002 Postdoctoral Fellow (Dr. Zhao Yu-fen), Departemnt of Chemistry, Tsinghua University, Beijing, China; Research: nucleic acid chemistry, phosphorus chemistry. 1995-2000 Graduate Research Assistant (Drs. 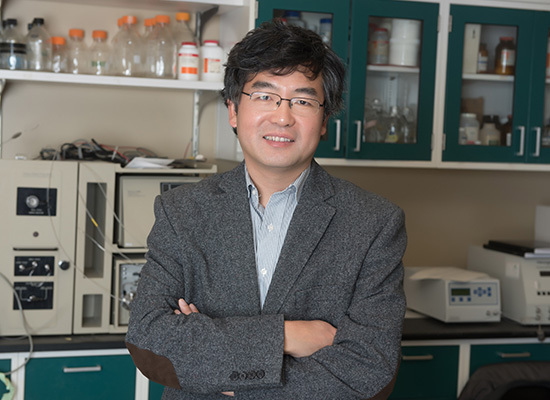 Cai Meng-Shen, Li Zhong-Jun), Departemnt of Chemical Biology, Peking University Health Science Center, Beijing, China; Research: carbohydrate chemistry, peptide chemistry. The current cancer drug discovery project focuses on the discovery of multifunctional hybrid drugs and drug combinations that can synergistically inhibit the growth of prostate cancer cells and leukemia cells. 1. Yi Liao, Xiaojia Niu, Bailing Chen, Holly Edwards, Liping Xu, Chengzhi Xie, Hai Lin, Lisa Polin, Jeffrey W. Taub, Yubin Ge, Zhihui Qin Synthesis and antileukemic activities of piperlongumine and HDAC Inhibitor hybrids against acute myeloid leukemia cell Journal of Medicinal Chemistry, 2016, 7974-7990. 2. Rayna Rosati, Bailing Chen, Mugdha Patki, Thomas McFall, Siyu Ou, Elisabeth Heath, Manohar Ratnam, Zhihui Qin Hybrid enzalutamide derivatives with histone deacetylase inhibitor activity decrease heat schock protein 90 and androgen receptor levels and inhibit viability in enzalutamide-resistant C4-4 prostate cancer cells Molecular Pharmacology, 2016, 90(3), 225-237. 3. Jia Luo, Sue H. Lee, Lawren VandeVrede, Zhihui Qin, Sujeewa Piyankarage, Ehsan Tavassoli, Rezene T. Asghodom, Manel Ben Aissa, Mauro Fà, Ottavio Arancio, Lan Yue, David R. Pepperberg, Gregory R. J. Thatcher Reengineering a neuroprotective, clinical drug as a procognitive agent with high in vivo potency and with GABAA potentiating activity for use in dementia BMC Neurosci 2015, 16,67-76. 4. Vandevrede L, Tavassoli E; Luo J,; Qin, Zhihui; Yue L; Pepperberg DR; Thatcher GR. Novel analogues of chlormethiazole are neuroprotective in four cellular models of neurodegeneration by a mechanism with variable dependence on GABA(A) receptor potentiation. Br J Pharmacol. 2014 171(2): 389-402. 5. Qin, Zhihui Modulating nitric oxide signaling in CNS for Alzheimers disease therapy (review) Future Medicinal Chemistry 2013, 5(12), 1451-1468. 7. Qin, Zhihui; Luo, Jia; VandeVrede, Lawren; Tavassoli, Ehsan; Thatcher, Gregory R.J. Design and synthesis of neuroprotective methylthiazoles and modification as NO-chimeras for neurodegenerative therapy Journal of Medicinal Chemistry 2012, 55(15), 6784-6801. 8. Michalsen, Bradley; Gherezghiher,Teshome; Choi, Jaewoo; Chandrasena, Esala; Qin, Zhihui; Thatcher, Gregory R.J.; Bolton, Judy L. Selective estrogen receptor modulator (SERM) lasofoxifene forms reactive quinones similar to estradiol Chemical Research in Toxicology 2012, 25(7), 1472-1483. 9. Gherezghiher, Teshome B.; Michalsen, Bradley; Chandrasena, R. Esala P.; Qin, Zhihui; Sohn, Johann; Thatcher, Gregory R. J.; Bolton, Judy L. The naphthol selective estrogen receptor modulator (SERM), LY2066948, is oxidized to an o-quinone analogous to the naphthol equine estrogen, equilenin Chemico-Biological Interactions 2012,196(1-2),1-10. 10. Schiefer, Isaac T.; Abdul-Hay, Samer; Wang, Huali; Vanni, Michael;Qin, Zhihui; Thatcher, Gregory R. J. Inhibition of amyloidogenesis by nonsteroidal anti-inflammatory drugs and their hybrid nitrates Journal of Medicinal Chemistry 2011, 54(7), 2293-2306. 11. Peng, Kuan-Wei; Chang, Minsun; Wang, Yue-Ting; Wang, Zhican; Qin, Zhihui; Bolton, Judy L.; Thatcher, Gregory R. J. Unexpected hormonal activity of a catechol equine estrogen metabolite reveals reversible glutathione conjugation Chemical Research in Toxicology 2010, 23(8), 1374-1383. 12. Peng, Kuan-Wei; Wang, Huali; Qin, Zhihui; Wijewickrama, Gihani T.; Lu, Meiling; Wang, Zhican; Bolton, Judy L.; Thatcher, Gregory R. J. Selective Esten Receptor Modulator Delivery of Quinone Warheads to DNA Triggering Apoptosis in Breast Cancer Cells ACS Chemical Biology, 2009, 4(12), 1039-1049. 13. Qin, Zhihui; Kastrati, Irida; Ashgodom,Rezene T.; Lantvit, Daniel D.; Overk, Cassia R.; Choi, Yongsoo; Van Bremen, Richard B.; Bolton, Judy L.; Thatcher, Gregory R. J. Structural modulation of oxidative metabolism in design of improved benzothiophene selective estrogen receptor modulators (SERMs) Drug metabolism and Disposition, 2009, 37(1), 161-169. 14. Yu, Bolan; Qin, Zhihui; Wijewickrama,Gihani T.; Edirisinghe, Praneeth; Bolton, Judy L.; Thatcher, Gregory R. J. Comparative methods for analysis of protein covalent modification by electrophilic quinoids formed from xenobiotics Bioconjugate Chemistry, 2009, 20(4), 728-741. 15. Wang, Zhican; Edirisinghe, Praneeth; Sohn, Johann; Qin, Zhihui; Geacintov, Nicholas E.; Thatcher, Gregory R. J.;Bolton, Judy L. Development of a liquid chromatography electrospray ionization tandem mass spectrometry method for analysis of stable 4-hydroxyequilenin-DNA adducts in human breast cancer cells Chemical Research in Toxicology 2009, 22(6), 1129-1136. 16. Qin, Zhihui; Kastrati, Irida;Bolton, Judy L.; Chandrasena, R. Esala P.; Hong, Liu; Petukhov, Pavel A.;Yao, Ping. ; Thatcher, Gregory R. J. Design & synthesis of benzothiophene SERMs with modulated oxidative activity & receptor affinity Journal of Medicinal Chemistry 2007, 50(11), 2682-2692. 17. Liu, Hong, Qin, Zhihui; Thatcher, Gregory R. J.; Bolton, Judy L. Uterine peroxidase oxidizes raloxifene and desmethylated arzoxifene to diquinone methides Chemical Research in Toxicology 2007, 20(11), 1676-1684. 18. Overk, Cassia R.; Peng, Kuan-Wei; Asghodom, Rezene T.; Kastrati, Irida; Lantvit, Daniel D.; Qin, Zhihui; Frasor, Jonna; Bolton, Judy L.; Thatcher, Gregory R. J.Structure-activity relationships for a family of benzothiophene selective estrogen receptor modulators including raloxifene and arzoxifene ChemMedChem 2007,2(10),1520-1526. 19. Yu, Bolan; Dietz, Birgit M.;Dunlap,Tareisha;Kastrati, Irida;Lantvit, Daniel D.;Overk, Cassia R.; Yao, Ping; Qin, Zhihui; Bolton, Judy L.; Gregory R. J. Thatcher Structural modulation of reactivity/activity in design of improved benzothiophene SERMs: Induction of chemopreventive mechanisms Molecular Cancer Therapeutics 2007,6(9),2418-2428. 20. Chang, Minsun; Overk, Cassia; Peng, Kuanwei; Qin, Zhihui; Yao, Ping; Bolton, Judy, L.; Kastrati, Irida; Thatcher, Gregory R.J.Activation of estrogen receptor-mediated gene transcription by the equine estrogen metabolite, 4-methoxyequilenin, in human breast cancer cells Endocrinology 2007, 148(10), 4793-4802. 21. Dowers, Tamara S.; Qin, Zhi-Hui; Thatcher, Gregory R. J.; Bolton, Judy L. Bioactivation of selective estrogen receptor modulators (SERMs) Chemical Research in Toxicology 2006, 19(9), 1125-1137 (review). 22. Huang, He-Qing; Li, Shu-Chun; Qin, Zhi-Hui; Cao, Sheng-Li; Yao, Yun; Liu, Yu-Shi; Li, Huai-Yu; Cai, Meng-Shen; Li, Zhong-Jun; Shi, You-En.Synthesis and bioactivities of two multiple antigen peptides as potential vaccine against schistosoma Bioorganic & Medicinal Chemistry Letters 2005, 15(9), 2415-2419. 23. Qin, Zhi-Hui; Lin, Chang-Xue; Ju, Yong; Zhao, Yu-Fen Synthesis of serine/alanine conjugated 3',5'-TpT Nucleosides, Nucleotides & Nucleic Acids 2003,22(1),63-69. 24. Qin, Zhi-Hui; Lin, Chang-Xue; Chen, Yi; Ju, Yong; Zhao, Yu-Fen Electrospray ionization mass spectrometry of serine/alanine conjugated 5'-UMP and 3',5'-dithymidine phosphoramidates Rapid Communications in Mass Spectrometry 2002,16(20),1997-2002. 25. Qin, Zhi-Hui; Liu, Hong; Li, Hui; Cai, Meng-Shen; Li, Zhong-Jun Synthesis of a potential tetrasaccharide ligand for E-selectin Carbohydrate Research 2002, 337(7), 621-628. 26. Qin, Zhi-Hui; Li, Hui; Cai, Meng-Shen; Li, Zhong-Jun Bromonium ion-promoted glycosidic bond formation and simultaneous bromination of an activated aryl aglycon. Carbohydrate Research 2002, 337(1), 31-36.